Customers asked for bigger screen sizes and Apple delivered. Isn’t it strange that people now want the watch although mobiles today are mainly used for surfing, mailing, shopping, and banking, tasks you cannot do with the iPhone’s expensive kernel-based accessory. 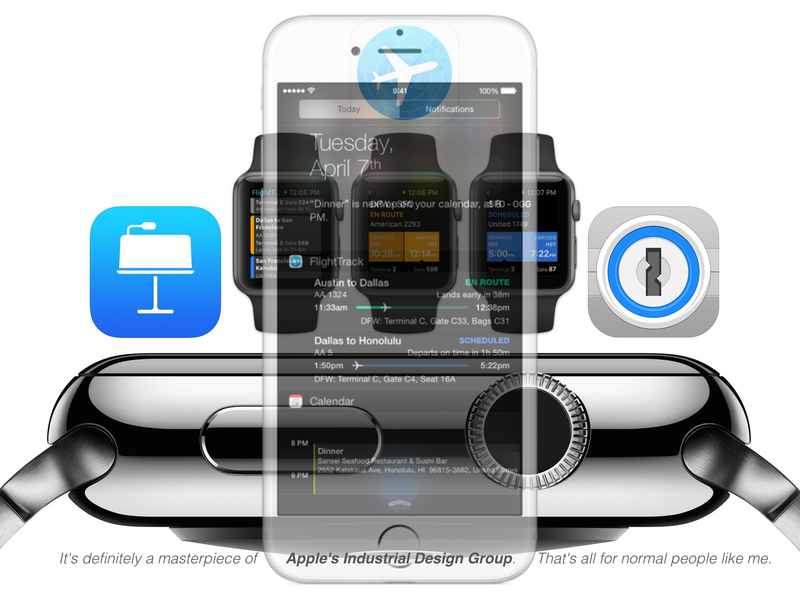 So the Apple Watch soon will be offered with a well-designed and innovative magnifier in Milanaise style. Well, many developers now offer their apps for Apple’s most personal device although there are some stumbles which make it hard to perceive the device’s overall usefulness. This update adds support for the Keynote Remote Apple Watch app. So you now can control Keynote presentations with the Apple Watch. Yes, but only if there is enough energy left in your watch. Maybe it’s better to buy two watches, one for the morning and one for the afternoon. Playing with e-loot is now transferred from the powerful brother in your hand to the eye-catcher at your wrist showing some signs of weakness. Linear presentations are a bit old-fashioned. Today non-linear presentations are preferred. The app Final Argument (top rated by numerous US professors) is in the line of applications allowing non-linear presentations. In contrast to Apple’s Keynote or Microsoft’s Powerpoint presentation tools slides can be arranged in a non-linear (in contrast to top-to-bottom) layout. With this kind of presentation, it is possible to jump to any out-of-order slides. Non linear presentations are excellent where audience participation is expected and encouraged. For instance a manager summarizing the latest progress of a project with his team, team members may interject to explain something, as a result the manager jumps to a different slide. With the Apple Watch we now have a fully sequential remote control, definitely a step backwards. Have you ever tried to see a preview of a slide on your watch before presenting it to the audience? Have you ever tried to navigate through your presentation to use it for a deeper discussion with your colleagues? To use an Apple Watch is a great idea but only if people get an innovative new kind of eyes adapted to their iThings which can manage the impressive screen size of an Apple Watch. Plus using both arms just to do the presentation, instead of just one hand holding the phone to click through the slides. It’s not only Apple but also other developers starting to deploy their app versions for the watch regardless of their usefulness. With FlightTrack for the Apple Watch, a glance at your wrist gives you the status of your current flight when you’re on the go! You can view more flights and details in the watch app to see terminal and gate information, seat assignments, baggage claim, confirmation numbers, and more! How many times a week do you get airborne? It might be useful but it’s much more likely that you don’t need it and your watch just shows you what’s right in front of your eyes on a 30 ft display board, not to talk about the untrustworthiness of data retrieved from various sources. If you don’t go forward, you go backwards. So it’s nice to have a Milanaise magnifier, possibly with a battery for charging the watch on the go. Time must always stay in motion. Apple Watch, the heart rate sensor, and the included Apple Watch apps are not medical devices and are intended for fitness purposes only. They are not designed or intended for use in the diagnosis of disease or other conditions, or in the cure, mitigation, treatment, or prevention of disease. So I still prefer to contact my doctor and clear things up by using the traditional methods and, more important, face-to-face communication. I’m pretty sure that you didn’t read this post on your watch. It’s Apple’s most personal device yet and so it’s everybody’s most personal decision to improve the company’s income statement or to breathe life into more efficient alternatives.